While clearing away the Christmas clutter, let’s hope for better days to come. Here are my three wishes for the local business community. 1. No more empty storefronts! Even a year ago I could smugly drive through Henderson Center and think, “Well, at least there aren’t any empty businesses HERE.” No longer. Gone are Finnegan & Nason (what happened to them?) , Robert’s , although there’s a liquor sales notice in the window so maybe something is happening there, the old Dalianes site is empty again.And HC is bustling- with a serious parking problem- compared to downtown. 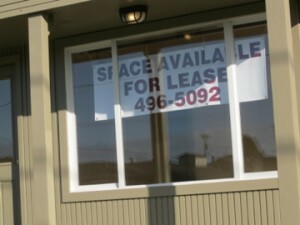 Empty commercial sites, like broken windows, are a sign of of an unhealthy community. The unoccupied Wendy’s, Plaza Design, and other empties on our main drag are a drag on our economy and certainly do not inspire confidence in anyone thinking of moving or investing here. 2. Better and more transportation options! We can throw money at all the second-tier airlines in the country , like throwing spaghetti against the wall and hoping it sticks, but how many more times will we have our hearts broken and our money consumed for no result? It’s time to admit that the airport is not viable for people who need reliability . Who will start a shuttle service to SF/SFO? I’m betting they’ll do well. Sign me up. While we’re at it, let’s wish for an exhaustive and credible study of the East-West rail option. I was a part of the Humboldt Bay Working Group that is adocating for the study and I’m still all for a CREDIBLE study of this option. 3. I wish that the flowering of entrepreneurship in Humboldt County continues to flourish. I hope that the rumored relocation of Mr. Arkley does not mean the end of the Economic Fuel program. The Link is sponsoring some exciting programs and there is an Inventors’ Group forming in Eureka. When times are tough, the tough get going. We have no other choice if we want to continue living in the best place on Earth. So Happy New Year, everyone. I was only kidding about cleaning up after Christmas. I like to leave my Christmas lights up until Chinese New Year.